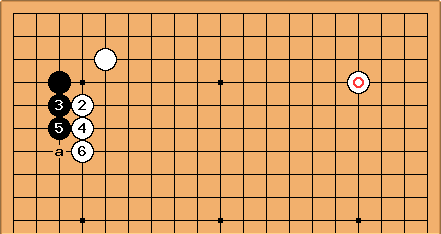 With White's star point stone in the top right a white play at a would force Black into a low position across the left and build some influence facing the star point. Similarly, Black playing b, for example, would allow White to force around a. So instead Black plays a to move up to the fourth line and try to combat White's development. Bill: A GoBase search confirmed my suspicion that a pincer is the most common type of response. Tenuki was also quite frequent. The kosumi is definitely a minority response, as is the wedge on the top side. Dave: We have to be careful in our analysis. With the colors as shown here (Black in the corner), the pincers are dominant. However, with colors reversed White's most frequent response is the kosumi. Here I was looking at games since 2002, i.e. the 6.5 point komi era. Bill: Again, a pincer was common, as was the taisha. If Black plays the kosumi, a simple elegant move, White's position is not so good ( at b or c may be better?). Black can complete the joseki with a move around a. 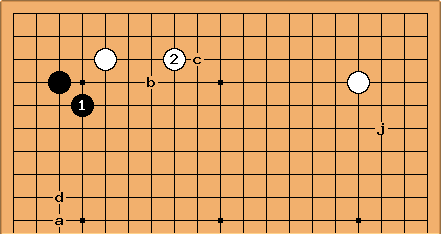 Bill: After the kosumi, White's position cannot be so bad, or the kosumi would be a frequent response. 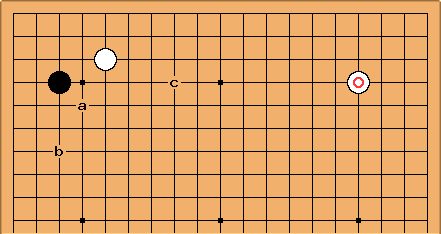 kokiri - in this spot, how urgent is a move on the RHS - say a black approach at j or an extension by white? Obviously the rest of the board needs to be taken into account, but is it an attractive area to look to play, or does the lowness of white's position on the left make it relatively uninteresting?